Democrats can make historic gains in Florida in 2018, from electing the state's first black Governor (Andrew Gillum) and first black Attorney General (Sean Shaw) to changing the makeup of the state legislature for the first time in decades. Florida needs new Democratic leadership for a host of reasons, chief among them the sorry state of the environment under the watch of Republican officials. It’s rarely good news for a politician to become a meme, especially when the meme involves scum. The ecological meltdown of Florida’s waters — a toxic rainbow coalition of red tide, blue-green algae and a touch of brown algae — has been very bad news for Gov. 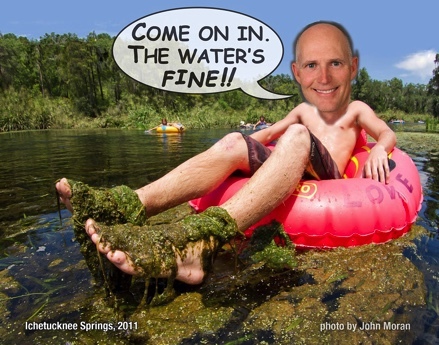 Rick Scott, or, as he’s been dubbed on social media, #RedTideRick. Before scenic beaches in snowbird meccas like Sanibel and Sarasota were inundated with dead manatees, dolphins and turtles, most polls had Scott ahead of Democratic Senator Bill Nelson, even as other Republican candidates struggled in more safely Republican states. The prediction model at FiveThirtyEight now gives Nelson a slight lead, a shift that seems to owe more to biological red tide than any political blue wave. Scott would prefer to focus the race on Florida’s low unemployment rate, Nelson’s low profile in Washington, and his own leadership handling storms like Hurricane Michael. But the putrid slime befouling his state has been difficult to avoid — Hurricane Michael actually blew the red tide back into Tampa Bay, where it littered the area's beaches with dead mullet — and Scott has found it difficult to change the subject. CLICK HERE for more information on how you can help Florida Democrats push back the "red-tide" in 2018. Blue Impact Network has identified several key races where your political donation can make a significant difference.